A reed relay is a type of relay that uses an electromagnet to control one or more reed switches. The contacts are of magnetic material and the electromagnet acts directly on them without requiring an armature to move them. Sealed in a long, narrow glass tube, the contacts are protected from corrosion. 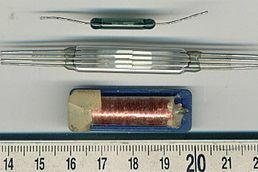 The glass envelope may contain multiple reed switches or multiple reed switches can be inserted into a single bobbin and actuate simultaneously. Reed switches have been manufactured since the 1930s. Compared with armature-based relays, reed relays can switch much faster, as the moving parts are small and lightweight, although switch bounce is still present. Also they require less operating power and have lower contact capacitance. Their current handling capacity is limited but, with appropriate contact materials, they are suitable for "dry" switching applications. They are mechanically simple, making for reliability and long life.